CHUTE SCHOOL AND MASTER’S HOUSE. The post mark is indistinct but, from the clothing, this would appear to be from around 1900. Subsequently in 1891 a Mary Catherine Scroggs gave the adjacent meadow to the Salisbury Diocese. 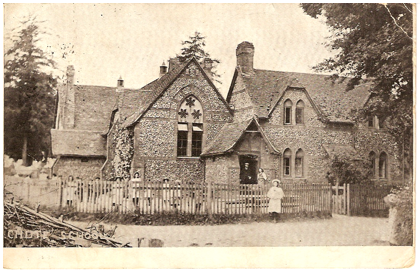 In Pevsners "The Buildings of England" the school buildings are described as “an attractive group, flint with brick trim”. Both the former school and the house are now Grade II listed buildings. Charles Eyles, whose family had lived in the Chutes for more than 350 years, wrote a memoir touching on his school days (“Uncle Charlie Relates”). He was born in 1905 the son of a farm bailiff. He presumably started school around 1911, and he says that there were two lady teachers and a head master. Infants wrote with chalk on slates and discipline was very strict. The punishments were caning or copying passages from the Bible. He records being punished so often that he won a prize for Scriptural Knowledge! He remembers a girl receiving six hard strokes of the cane on each hand, with the vicar and the whole school watching; a most salutary effect. On Saturdays and holidays he would earn a shilling (5p) a day uprooting weeds or picking flints in the fields. The flints would be broken and used to surface the roads; there were no tarmac roads in the area. Miss Taylor, who became Mrs James, was the longest serving “head”, arriving in 1918 and finishing in the 1940s. A niece of hers (and two subsequent generations) still live in the village. In 1926 the school had 59 pupils but numbers declined over the years. In those days, children walked into the school from as far as Hippenscome and parts of Clanville. In the 1930s there were two classes in the main room divided by curtains. This was well before piped water came to the village. Drinking water was drawn from the well in Standen House and for heating there was a coke stove. The local “managers” were responsible for the upkeep of the buildings and held fund-raising events and collections. In 1949, the managers were trying to raise funds to connect the school to the mains water supply shortly due to arrive in the Chutes and to replace the earth closets with water closets or with new earth closets! Children from 5 to 14 years old were taught until 1944, when the 11 + exam was introduced. After 1944, 12 year olds went either to Castledown School or to Grammar Schools in Andover or Marlborough. The school closed in 1978. The master’s house was sold in 1979 and the school became the Village Hall in 1980. 1882 – Edith A Smith. (b 1863 Mawgan Cornwall) & Annie Mills. 1894 – Sylvia S Walker. 1903 – E W Medway. (b 1846 Oxford, m Cordelia). 1912 – Cornelius Charles Barker. 1915 – R C Webb. 1918 – Miss E E Taylor (Mrs James). 1943 – Miss Grace Brear. 1946 – Frances E Wheeler. 1954 – Kathleen Ann Patricia Rintoul. 1957 – Miss W Haggar. 1961 – Miss Groves (temporary). 1962 – Derek J Mason. 1966 – Miss Groves (temporary). 1967 – Robert F Major. 1975 – Mr O’Brien (acting head). The personal details of birth and marriage were obtained from 10 yearly census records, which is why we have them for some heads but not for others. It is interesting that, even in the 19th century, they came from such a wide area.